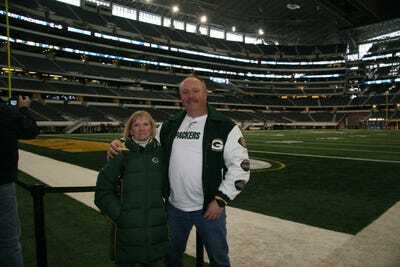 After reading our pre-Super Bowl story advising fans that the best strategy for getting tickets was to go to Dallas without them, Curt Cozad, a California firefighter, e-mailed us to say that he and his wife, Michele, would be employing that exact strategy. 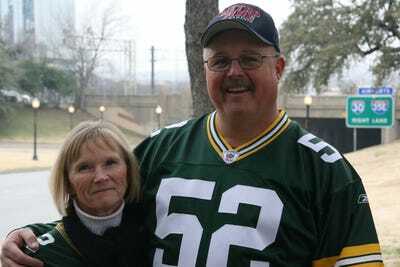 The Cozads are die hard Packers fans and despite her trepidations about arriving empty handed, the two quickly kicked their plan into action. 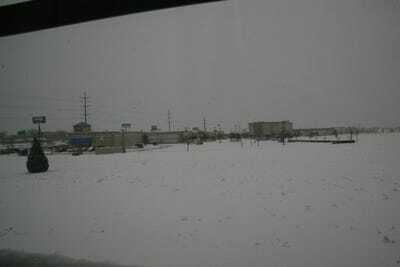 Cozad first went about trying to secure lodging. Luckily, a friend who works at Hilton found them a king suite with a kitchen at a Hilton Homewood Suites in Allen (about 30 minutes from Cowboys Stadium), for $99 a night. Next, the Cozads had to move around their airline miles. 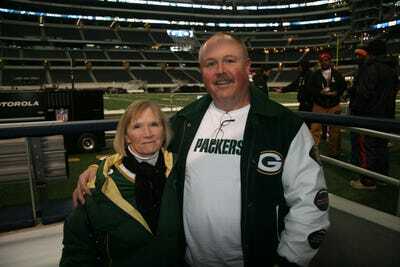 They had to stay in Dallas for 10 nights in order to make the miles work, but they were able to find a flight to Texas. 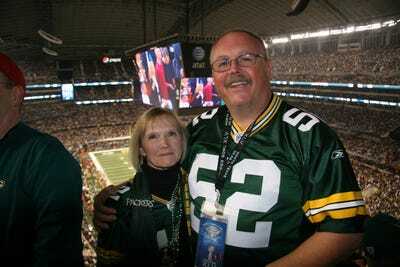 They arrived in Texas the Sunday before the Super Bowl and still didn’t have tickets. 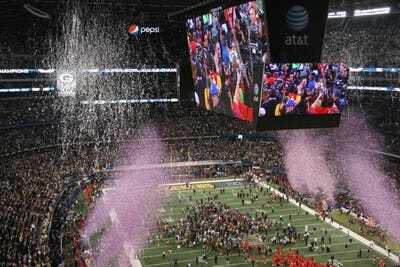 The story has a happy ending, but not without the Cozad’s finding plenty of problems with Cowboys Stadium, the weather, and a very distracting TV. 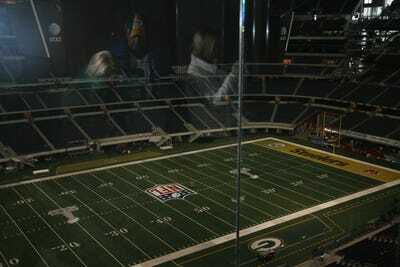 Would they ever return to Dallas for another Super Bowl? 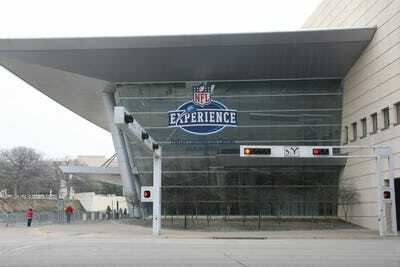 The Cozads' first stop on Monday was at the NFL Experience. They knew it was closed but wanted to check out the pro shop anyway. 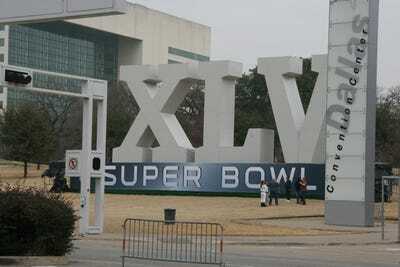 The Cozads had stopped to take photos in front of a big Super Bowl XLV sign when a police car rolled up. Two police officers offered to take pictures for them, then took them on a tour of Dallas for an hour and a half. The cops demonstrated some classic Southern hospitality and showed them around a few key landmarks, including the JFK Assassination site. 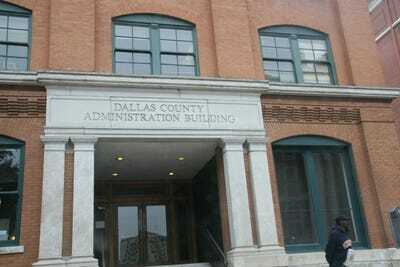 DEALEY PLAZA: The cops made one request: they wanted the Cozads to get them a souvenir cup from the Super Bowl. They were happy to comply. 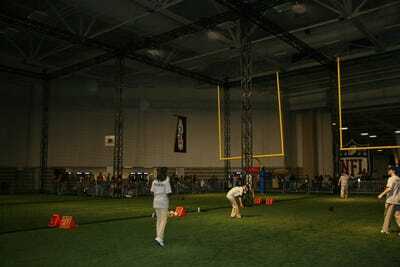 The NFL Experience was still open though, so the Cozads went back. 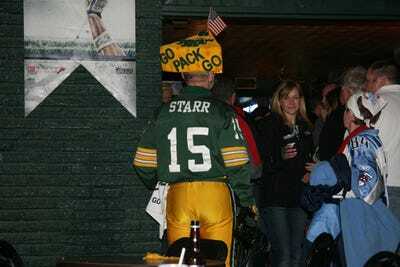 It proved to be a hot ticket for fans that arrived early in the week. There was also no one at the Will Call desk. It took 20 minutes for someone to show up, and then they didn't know the computer's password. 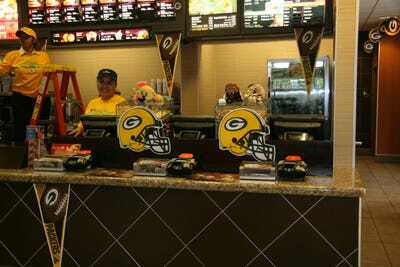 They missed their tour by an hour, then when they tried to buy Packers gear from the pro shop, the receipt printer broke and they were forced to wait an hour before it was fixed. 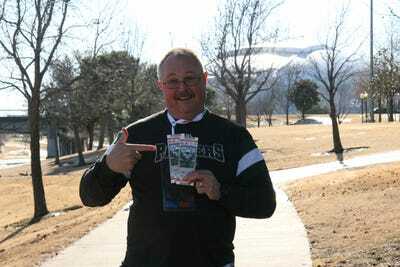 Curt woke up early every morning to check ticket prices, but it wasn't until Friday that he finally pulled the trigger on a StubHub purchase. They paid $5,400 for one pair. 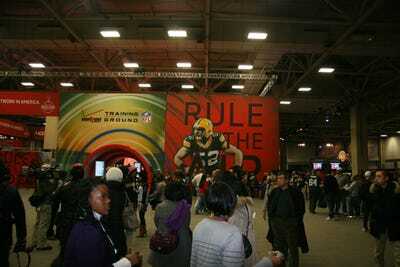 StubHub was set up next to the Arlington Convention centre and offered fans refreshments as they picked up their Super Bowl tickets. After getting their tickets, the Cozads attended a couple pep rallies in anticipation of the game. 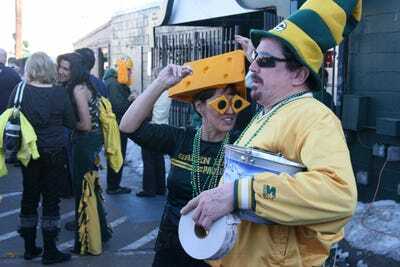 Of course the pep rallies were outside, but Packers fans are used to it. The Cozads ran into lots of characters like these. Finally, Super Bowl Sunday arrived. 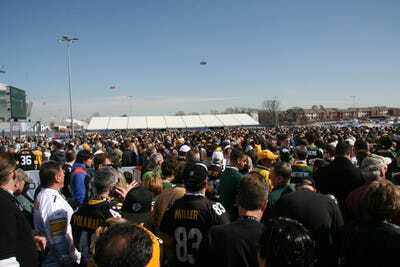 But the line to get into Cowboys Stadium was almost 3 hours long. Curt says that he later found out the wait was so bad because 4 of 6 stadium entrances were closed due to the falling ice that made headlines. 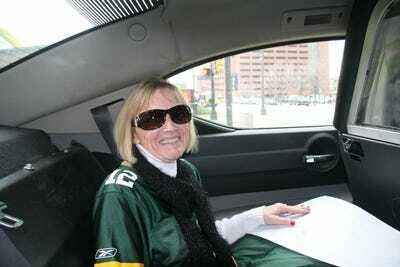 The Cozads typically go to Lambeau Field twice a year, but skipped their first planned trip for the Cowboys game because Tony Romo was out. 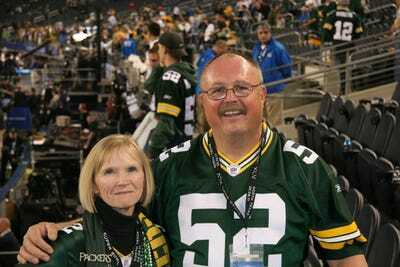 They passed on the second game to save money for a playoff trip, those missed games became Super Bowl XLV. 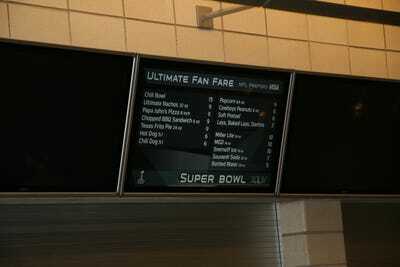 They tried to save money wherever possible, but prices like these (and the $45 Super Bowl XLV Champion hats) made it tough. 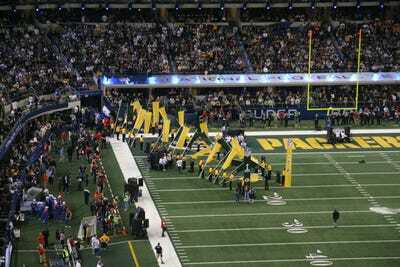 Here's the view from the Cozads' seats during player introductions. 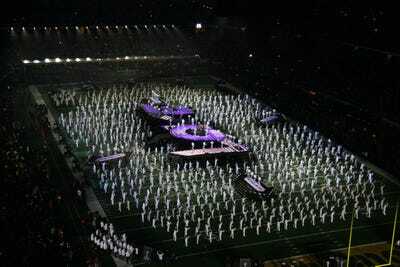 They had a pretty cool perspective of the Black Eyed Peas' halftime show. 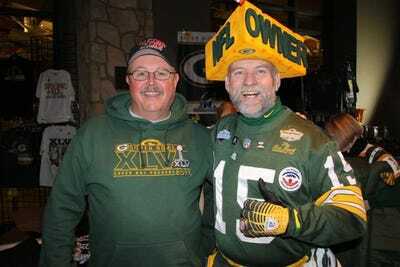 Despite some of the inconveniences of their trip, the Packers won, and the Cozads got to be a part of the celebration.